Schisandra berry against hair loss (1 hairprotection point)	Noch nicht bewertet. 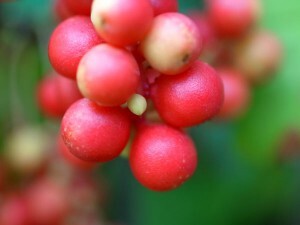 The Schisandra berry is among the Chinese already several thousand years on the menu. Specifically, the phenolic lignans from Schisandra berry is said among many other promises of salvation that they strengthen the immune system and exert a favorable influence on hereditary hair loss in men. The Chinese medicinal herbs compendium of 2,600 BC promised the regular consumption of small red berries, old age and increasing life energy. Schisandra is regarded as so-called „adaptogen“, which by definition stimulates all organs and imbalanced body functions will return to its natural state. Schisandra tastes sweet and sour, bitter, slightly salty and slightly pungent. The berries contain carbohydrates, fibers, proteins and vitamins C, E, beta-carotene, vitamin B1, B2, B6, niacin, and the minerals calcium, magnesium, iron, selenium, iodine, cobalt, phosphorus, potassium and sodium. In addition, they contain about 30 different lignans. These act as antioxidants neutralize free radicals. Schisandra is to increase the desire for love and virility. Therefore, the berries also find in most Chinese herbal formulas to increase potency. They should strengthen both male potency and female libido.